If you couldn’t make it to EuroLambretta 2013, which is about to kick off any minute now, or youron your way / already there and you are already thinking about next years, it’s in Davos, Switzerland. Now the only two things I know about Davos, are 1) They hold financial summits for the G8 countries there, and 2) It sounds a bit like Davros… leader of the Daleks. So I won’t be much help. But maybe this Wikipedia article will. 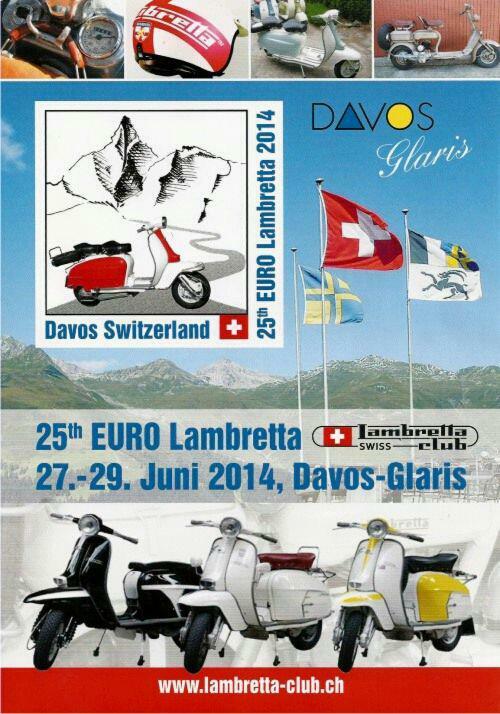 The dates are 27th– 29th June, and more details will be forthcoming, once the current Euro is over, from the Lambretta Club Swiss. It’s actually only 2 miles further than Avignon, according to a quick bit of ‘research’ on Google Maps, but I have heard that Switzerland is quite “hilly”. I expect this rally will run like clockwork. This entry was posted in Lambretta Life, News, Scooters and tagged 2014, Avignon, Davos, Euro Lambretta, Events, Glaris, Lambretta, News, Rally, Switzerland by crocodilejock. Bookmark the permalink.